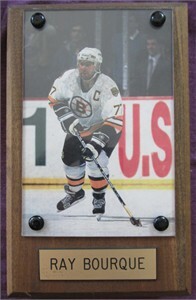 Wooden plaque with roughly 3 1/2 by 5 1/2 inch photo of legendary Boston Bruins superstar Ray Bourque. Made of solid wood about 1 inch thick with beveled edges. Has engraved nameplate (has marks on the lower left area). ONLY ONE AVAILABLE FOR SALE.